Posted on Monday, March 5th, 2012 at 12:49 pm. 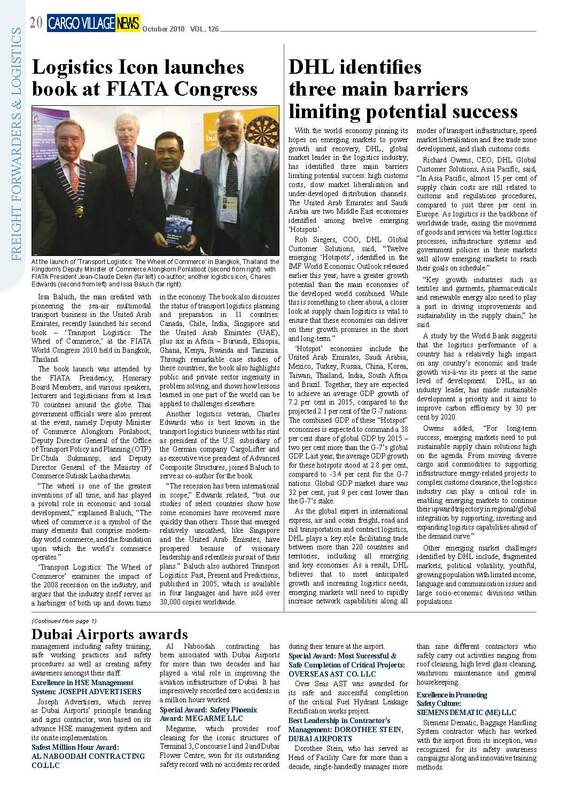 Issa Baluch, the man credited with pioneering the sea-air multimodal transport business in the United Arab Emirates, recently launched his second book – ‘Transport Logistics: The Wheel of Commerce,’ at the FIATA World Congress 2010 held in Bangkok, Thailand. The book launch was attended by the FIATA Presidency, Honorary Board Members, and various speakers, lecturers and logisticians from at least 70 countries around the globe. Thai government officials were also present at the event, namely Deputy Minister of Commerce Alongkorn Ponlaboot; Deputy Director General of the Office of Transport Policy and Planning (OTP) Dr.Chula Sukmanop; and Deputy Director General of the Ministry of Commerce Sutisak Laohachewin. argues that the industry itself serves as a harbinger of both up and down turns in the economy. The book also discusses the status of transport logistics planning and preparation in 11 countries: Canada, Chile, India, Singapore and the United Arab Emirates (UAE), plus six in Africa – Burundi, Ethiopia, Ghana, Kenya, Rwanda and Tanzania. Through remarkable case studies of these countries, the book also highlights public and private sector ingenuity in problem solving, and shows how lessons learned in one part of the world can be applied to challenges elsewhere. Another logistics veteran, Charles Edwards who is best known in the transport logistics business with his stint as president of the U.S. subsidiary of the German company CargoLifter and as executive vice president of Advanced Composite Structures, joined Baluch to serve as co-author for the book. “The recession has been international in scope,” Edwards related, “but our studies of select countries show how some economies have recovered more quickly than others. 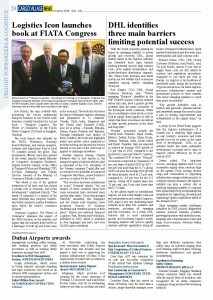 Those that emerged relatively unscathed, like Singapore and the United Arab Emirates, have prospered because of visionary leadership and relentless pursuit of their plans.” Baluch also authored Transport Logistics: Past, Present and Predictions, published in 2005, which is available in four languages and have sold over 30,000 copies worldwide.